When Santa Fe was founded by the Spanish in 1607, official records show that an inn or “fonda” was among the first businesses established. Since then, there has always been a fonda on the Plaza to host traders, politicians, celebrities, and travelers of all kinds. In 1821 when Captain William Becknell completed the first successful trading expedition from Missouri to Santa Fe–-a route which came to be known as the Santa Fe Trail--he enjoyed the hospitality at the historic inn at the trail’s terminus, the town’s central Plaza. The current La Fonda was built in 1922 on the site of previous inns. 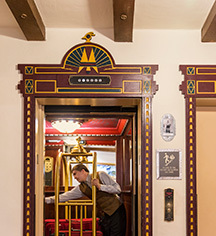 In 1925 it was acquired by the Atchison, Topeka and Santa Fe Railroad which leased it to legendary hotelier Fred Harvey who operated it as one of his renowned Harvey House Hotels for more than 40 years. In 1968, the property came under local ownership and remains so today. 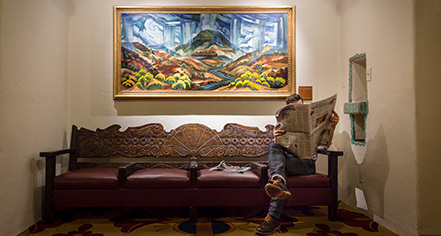 Throughout its history, La Fonda has been synonymous with Southwestern hospitality and is still the true heart of Santa Fe for visitors and locals alike. La Fonda, a member of Historic Hotels of America since 1991, dates back to 1922.